Properties See a wide selection of our properties. Please fill out the form below and the sales team will be in contact shortly. A Stylish and Spacious Newly Refurbished Edwardian Family House in this Desirable & Convenient Location.A beautifully designed 4 bedroom extended family home creatively refurbished to a high standard. 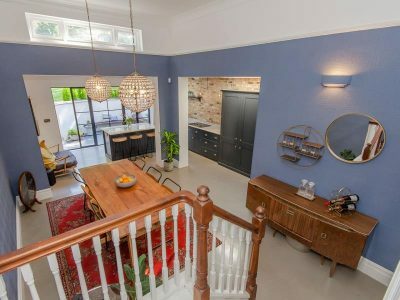 This stylish character property has been extended and redesigned to create an ideal family home offering a blend of striking contemporary space with classical period style and proportion. The principal living space incorporates a vaulted dining area with high level southerly windows, the hand built kitchen area is fully equipped, the breakfast island is flooded with light, a wall of glass with top quality steel doors overlooks and gives access to the patio area and Southerly facing landscaped garden. The principal living space leads directly to a cosy TV Gaming room and the spacious Drawing room is situated on the raised ground level. Four bedrooms and three bathrooms (2 en suite) complement the generous living space and wonderful lofty stairways wind throughout the house. Sign up with us to receive property alerts, manager your contact details and save your favourite properties.